Besides the Freedom Trail, there is another source of free entertainment in Boston, and in almost any other big city. Brewery Tours and tastings are held at local breweries across the country. Be sure to visit one when you travel and soak up the local culture. 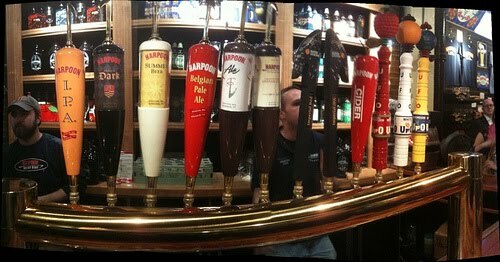 We visited Harpoon Brewery at one of their daily tasting times, which are listed on their website. Everyone was given a 4 ounce taster cup and a staff member talked about each of the beers... and then we got to try as many of them as we wanted! We didn't have to buy anything, we didn't have to pay for the tasting, it was all free. Lots of breweries host free brewery tours and tastings hoping that you'll really like their beer and take some home or become a lifelong fan. So for us, that means free beer, sometimes occupanied with a free brewery tour...and that is free cultured entertainment, folks.